Our product range includes a wide range of mid span joints. Our in-depth knowledge and industrial expertise enable us to offer a distinguished range of Mid Span Joints. 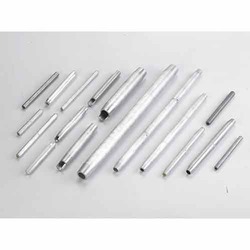 We manufacture these unique joints by making use of high-grade raw material and high-end technology so as to maintain the set industry standards. To make a flawless dispatch from our end, our offered range is rigorously inspected by our quality inspectors against various parameters. These span joints are broadly acknowledged by our clients for their light weight and durability.